Calts are tall, slender, humanoid cat like creatures, which have light sleek fur and a long tail. Their slight build makes them extremely lithe, fast, and agile. Because of this they often make good thieves, and may have been the source of the term "Cat Burglar." Although they usually stand erect, Calts can run on all fours, allowing them sometimes miraculous speeds and jumping ability. When walking normally, some seem to lope, and all are always twitching and moving around, seemingly unable to stand still. It has been noted that should a Calt stand still for any length of time, its tail will start to twitch. When asked, they insist that it is as rock steady as they are. The frame of the Calt suits them for hot climates, especially deserts. This makes them rare in northern lands or even areas that see winter. Cat Folk are wanderers, and although their race is typically nomadic, they have set up small trading towns at Oasis and other places of note all through the Desert Lands. Many of them live their lives as merchants, but their cat-like curiosity often gets the better of them and they become adventurers. The body of a Calt is built for climbing and running. May carry 8+1d3 very large items. The Calt grows to between four and a half and five and half feet tall and will normally weigh between 90 and 120 pounds. The Calt has Night Sight. See the seperate write up on Sights for a description of Night Sight. The Calt starts the game with the Desert Craft skill at a synergy level of 12+0. This is in addition to any other skills the Calt character may get during the character creation process. In addition, the dice associated with this skill goes from Regular 1 to Easy 2 for the Calt character. The Calt starts the game with the Balance and Climbing skill at a synergy level of 8+0. This is in addition to the skills the starting player may pick for the Calt. In addition, the dice associated with these skills goes from Regular 1 to Easy 2 for the Calt character. In addition, the Calt add +2 to the dice roll whenever he or she tries to increase his or her level in the Balance or Climbing skill. Have the player roll percentile. If the roll is 20% or less the Calt character will start the game with the Merchant life skill. The player does not have to make this check since the skill will count towards the total number of life skills the character can have. It is very easy for the Calt to learn the following skills; Concealment, Escapist, Identify Sound, Move Un–noticed, and Reduce Fall. In addition, the dice associated with these skills goes from Regular 1 to Easy 2 for the Calt character. The Calt character finds it hard to learn the skills of City Craft, Swimming, Water Craft, and Winter Craft. The associated Dice rating of these skills go to Hard 2 for the Calt. Only the Calt can take the Battle Claw + Battle Claw weapon combination. If the Calt takes this weapon combination then it must be chosen as a strength at a cost of 20 points (see also, Section 1 of the manual, under the Strengths and Weaknesses; Dual Weapon Skill). If the Calt does choose this weapon combination, then its Dice rating goes from Hard 2 to Regular 1 for the Calt Player. Due to the Calt's relatively small size, it is hard for the Calt to learn the following; Large Shield, Kite Shield or Spiked shield. 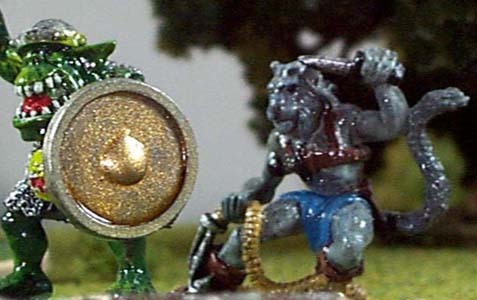 The Dice figure for the Large and Kite shield go from Regular 1 to Hard 2. The Dice figure for the Spiked shield goes from Hard 2 to Hard 3. Due to its relatively small size and to the way the Calt moves, it finds it hard to master the following melee and missile weapons, 2 Handed Axe, Bill, Glaive, Halberd, Lance, 2 Handed Mace, Morning Star, Pike, Pole Axe, Spear, Staff, Arquebus, Long Bow, Flintlock, and Musket. The dice associated with these weapons change as follows. The 2 Handed Axe, 2 Handed Mace, Flintlock, Halberd, Lance, Morning Star, Spear, and Staff, go from Regular 1 to Hard 2 rating. The Arquebus, Flint Lock, Bill, Glaive, Halberd (group), Musket (matchlock), Pole Axe and Spear (group) go from a Hard 2 rating to a Hard 3 rating. The Long Bow and Horse Bow go from a Hard 3 rating to a Hard 4 rating. Subtract one from the attack speed of any melee weapon that a Calt uses; this includes the battle claw(s) as well. This adjustment is done before all other adjustments and only applies to actual weapons (read as; does not include shields). The Calt may perform a burst of speed and may maintain this speed of 18 + 2d4 for 1d4+1 combat rounds. When the Calt wishes to perform a burst of speed (i.e., he runs after someone) roll for the speed the Calt obtains (18+2d4 inches per combat round) and for the length of time he will maintain the speed (the 1d4+1). The Calt cannot perform a burst of speed if wearing metal armor. The Calt may panic if in water. The chance of this happening is 20%, checked each combat round. If panicked it will take 2d6 combat rounds for the Calt to drown unless he/she gets outside help. The Calt will land feet first when falling greater than 3 feet so long as the Calt is not wearing metal armor. If wearing metal armor there is a 40% chance that the Calt will land on its feet if falling greater than 9 feet. If the Calt lands on its feet, then you subtract 10 feet from the fall distance when working out the consequences of the fall. When asleep, the Calt player may use the following table to determine if he is in a deep sleep. Roll 1d100.